Divine souls of Purgatory, I bear tidings. My name is Petur “Scarpia” Thorarinsson, your faithful creative and game design lead for In Death. If you missed my inaugural In Death dev blog when we entered Early Access I recommend reading it here. We here at Sólfar Studios are eternally grateful for the warm reception you’ve given In Death during Early Access. Much like we relied on our Beta testers to reach Early Access, we are relying on you to help us reach the stage where In Death can enter Full Launch. We have been hard at work incorporating your feedback into our designs, fixing the bugs you’ve found and developing new and exciting additions to In Death. Today we are ready to unveil two major additions, and what’s more important is that they’re included in today’s update so you will be able to get your hands on them immediately and tell us what you think! The second addition to In Death we are launching today are the Pits of Damnation. In the god-forsaken afterlife, the constructs of heaven are crumbling, and entities long forgotten are emerging from the cracks. When you venture into Purgatory, you will occasionally encounter a fiery gate surrounded by wraiths that have escaped from one of the pits, evading eternal damnation. If you dare enter one of these gates, you will be subject to the Pits of Damnation. 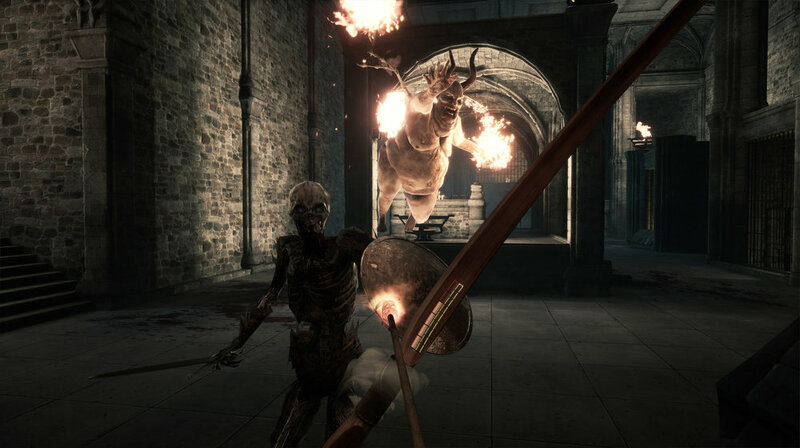 In the Pits you will encounter new and harder enemies which you must overcome if you hope to escape. If you survive the punishment in the Pits it will be worth the effort as you’ll be rewarded handsomely before emerging back to Purgatory. To go with this update, we are also adding a few new arrow types – so keep your eyes peeled for new tools to tear through your enemies! For the sake of getting this new content in front of as many of you as possible, we chose not to lock any of it with achievements for the time being. This means that everything above is available to you as soon as you log into the game regardless of your achievement score. That’s it for now, we have a lot more features and content on the horizon which we’re dying to tell you about, so stay tuned – it won’t be long!